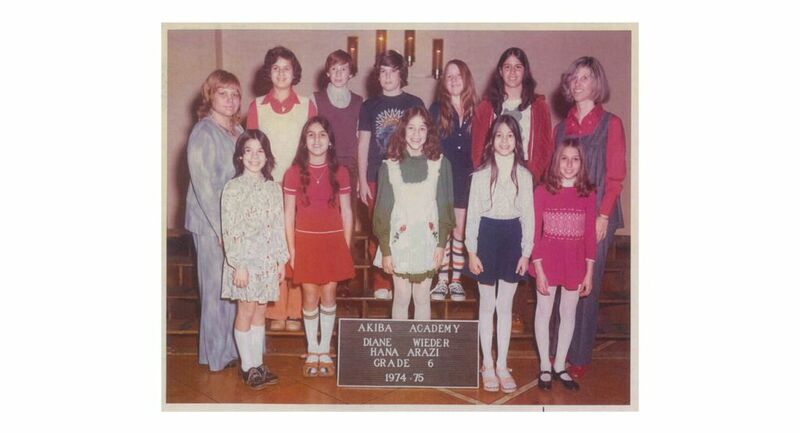 In 1968, Akiba Academy opens its doors, becoming the first non-Orthodox Jewish Day School in the West Coast. 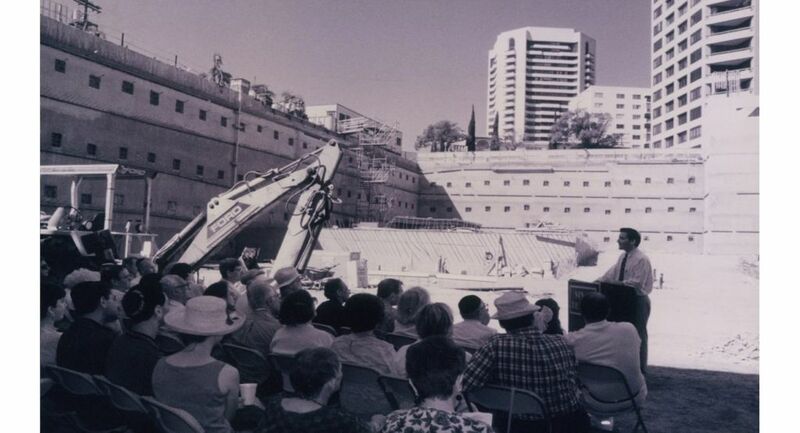 Slow and steady improvements allowed the school to grow organically with overwhelming support from the Los Angeles Jewish community. 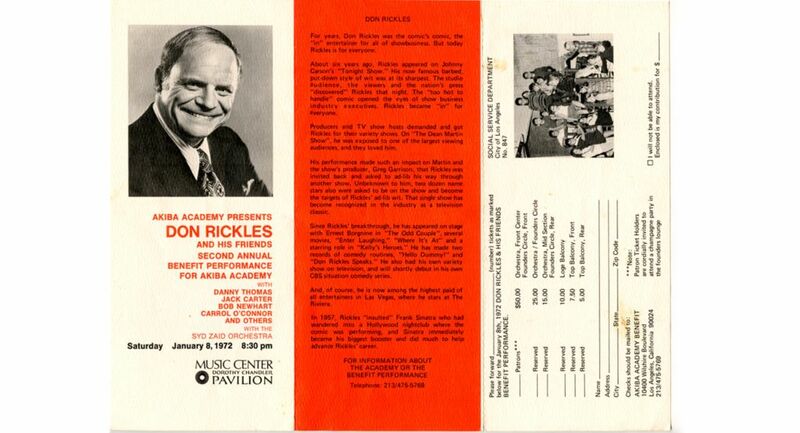 Second of Three Fundraisers hosted by Don Rickles. Lay Leaders Herschel and Miriam Elkins mail postcards inviting the Jewish community to discuss whether to open what would be at the time the first non-Orthodox Jewish day school in Los Angeles. They are instantly flooded with support, and 40 couples attend the very first gathering. Akiba Academy is established with an initial contribution of $1,010. Founding Rabbis: Rabbi Joseph Wagner, Rabbi Jacob Pressman, Rabbi Edward Tenenbaum, Rabbi Hillel Silverman. Dr. Walter Ackerman becomes Founding Educational Director. 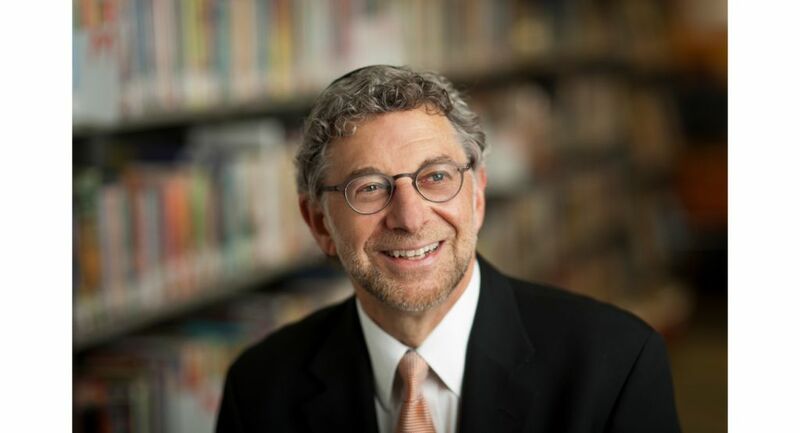 Akiba appoints its first headmaster, Rabbi Elliot Spiegel, who will lead the School until 1975. Legendary comedian Don Rickles hosts fundraisers for Akiba Academy in prestigious venues such as the Dorothy Chandler Pavilion. Joining him are screen luminaries such as Red Buttons, Bob Newhart, Jack Carter, and Carroll O’Connor. Akiba receives accreditation from the California Association of Independent Schools (CAIS) and graduates its very first class (below). Nahum Lainer becomes Board Chair, deepening the Lainer family’s long-standing leadership in the School and the Temple. Rabbi Laurence Scheindlin begins his impactful tenure as Headmaster. He will help lead the Akiba community through an exciting and dynamic chapter of its history, all the way until 2012. Akiba Academy Orchestra forms under the direction of Bryna Vener. As it turns 13-years-old, Akiba Academy becomes a bar mitzvah and expands to include 7th and 8th Grades. Sinai Temple completes construction of Krauss Pavilion, including the fourth-floor classrooms, gymnasium, and patio. Tal Selah pilot program is implemented into the Judaic studies curriculum making Akiba Academy the first school on the West Coast to give students the opportunity to learn Hebrew through interactive technology. Sinai Akiba Academy merges with Sinai Temple and gets its new name: Sinai Akiba Academy. Blumenthal Library implements personal computers. Sinai Akiba Academy computer lab is opened with 10 Macintosh Desktops for student use. Lab is made possible through funds provided by the PTA and Sinai Temple Sisterhood. The George and Pam Smith Resource Center is opened to provide educational support for children with learning differences. Sinai Akiba Academy Orchestra tours Israel and performs for dignitaries such as the former Prime Minister of Israel Ehud Barak and Mayor of Jerusalem Teddy Kollek. Sinai Akiba Academy’s 8th Grade math class wins the National Contest for Excellence in Math Award. As newcomers to the San Fernando Valley Sports Leagues, Sinai Akiba Academy’s sports program wins five championships! Sinai Akiba Academy is awarded the Solomon Schechter Gold Award for the School’s outstanding achievements, originality, and quality of programming in Judaic Studies. A new name, a new headmaster, and a renewed commitment to excellence in Jewish education is felt throughout the School as a new era approaches. In 1986, Sinai Akiba Academy merges with Sinai Temple and gets its new name: Sinai Akiba Academy. With added innovative programming, Sinai Akiba quickly becomes a pioneer and an example of best practices. A $9.5 million renovation of the third and fourth floors of the synagogue and middle school is completed. Through teamwork and community support, the new building allows the School to grow and serve its students better than ever before. New goals are set and met with ever-growing support from the Sinai community. The Weinberg Family Gym opens. Groundbreaking for the Temple and School expansion. Fun fact: The demolition work done for this project wound up getting filmed and featured in the 1997 Tommy Lee Jones disaster flick "Volcano." Rabbi David Wolpe begins as Senior Rabbi at Sinai Temple, and immediately becomes a significant part of shaping the School’s identity and path. Dora and Neil Kadisha Teacher’s Appreciation Award is awarded to teachers for every 7th and 20th year of service. 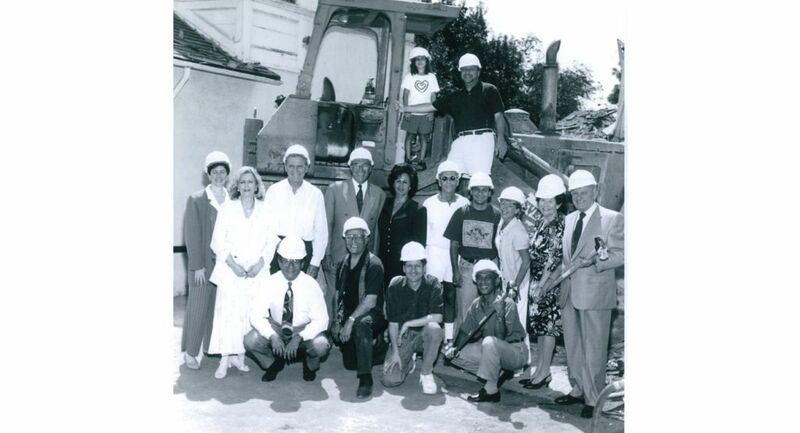 Kirk and Anne Douglas dedicate the Douglas Family Early Childhood Center to Sinai Temple’s preschool, in honor of Kirk’s second bar mitzvah at age 83. 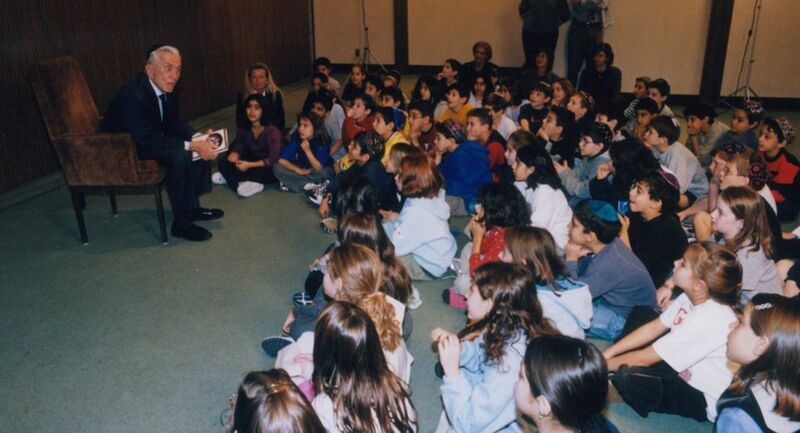 Mr. Douglas drops in to hold court with the 3rd and 4th-grade classes, 1999. Plans for Alice and Nahum Lainer Learning Center are compiled for the remodeling of the library and common area. Center opens in 2007. A Powerful, Culminating Experience: The 8th Grade Israel Trip is formally instituted as an annual program for our graduating class. Middle School gets rebuilt (third and fourth-floor building renovations will be completed later on, in 2012), as part of funds raised by the Centennial Campaign. Orchestra performs in Carnegie Hall. Sinai Akiba Academy launches the Generations LA endowment campaign, in partnership with Builders of Jewish Education (BJE), which will significantly increase the school’s endowment. Sinai Akiba Academy welcomes new Head of School Dr. Sarah Shulkind. The Early Childhood Center and Kindergarten modernize the playgrounds and integrate research-based design in classrooms. Schoolwide implementation of J-STEAM, which integrates Judaica, Science, Technology, Engineering, Art and Math, begins—which will lead (in 2015) to the installation of our beloved Innovation Lab, a space for creativity and limitless experimentation, and the renovation of two science labs. A new program is established for 7th graders to participate in an innovative student exchange with New Horizon, a Muslim day school in Pasadena. Students engage in learning, share personal stories, and visit each other’s schools over the course of a few days. Sinai Akiba Academy expands to include the Douglas Family Early Childhood Center and our school becomes a place for children 18 months – 14 years-old. A beautiful and spacious new Parenting Center opens, attracting families from diverse communities to gather and watch as their children play, learn, and grow. Our age range at the school further expands to include birth all the way through 8th grade. The School celebrates its 50th anniversary, commemorating 50 years of community and excellence in educating the mind, heart, and soul of every student. The Annual Gala welcomed 750 attendees, making it the largest gathering in school history, with alums and former faculty attending from all over the country, and a wait list of over a hundred people. Over a million dollars was raised in support of the school, making it the largest grossing event for our School. 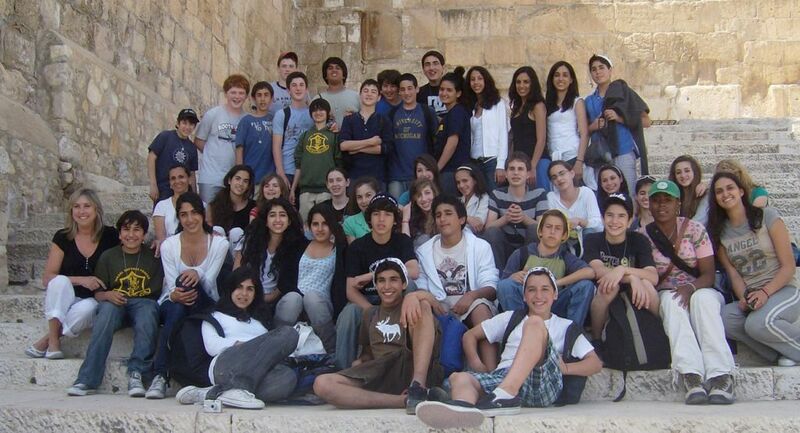 Sinai Akiba Academy maintains a distinctive place in the national Jewish educational landscape. We are a visionary school whose mission lies in helping our students learn their place in the world, by immersing themselves in both longstanding tradition and cutting-edge technology; by problem-solving and by learning to compromise. It is a curriculum that combines joyous exploration with academic rigor to shape excited, curious, resilient learners and citizens. The excellent, comprehensive education we provide for Jewish children turns out smart, compassionate young leaders who recognize the dignity of every human being and wish to use their understanding of Jewish values to make the world a better place. With its brand-new, dedicated space, our Parenting Center enrollment increased dramatically over the last year from 67 to 407 families. Parents wind up making lifelong friendships and, critically, gain an introduction to our supportive learning environment. Our graduates attend (and are well-prepared for) the best private and public school programs throughout Los Angeles. Over 90% of our 8th-grade graduates are accepted to their first choice for high school. 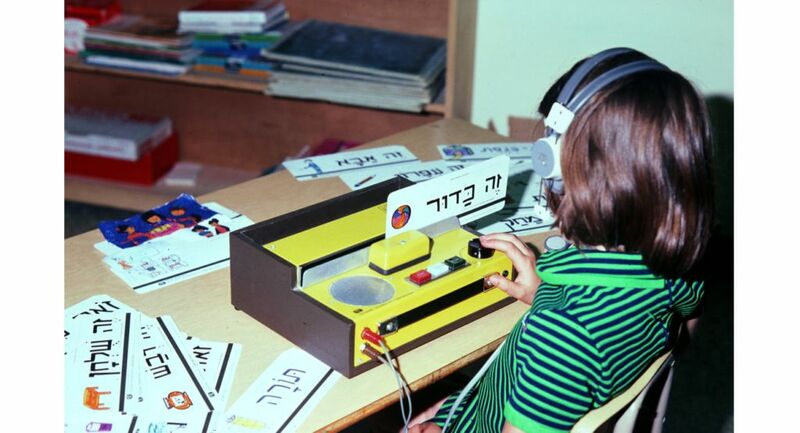 Through immersive dual language instruction in Hebrew and English, our students reap the proven cognitive and social benefits of learning in more than one language, engaging authentically with Jewish texts and traditions on a daily basis. As extensive research has shown, students who learn a second language (or third or fourth…) can approach all their subjects—from math to science to art and beyond—from different perspectives, giving them significant intellectual and personal advantages. With a state of the art facility and innovative breakthrough programming, Sinai Akiba Academy reaches new heights in academic excellence and Jewish living.